Yasue Tanaka CAMTC, CST, OFT has dedicated the last over 30 years to exploring the subtle relationships between body and spirit, bringing spacious stillness into this world through healing work. She is committed to helping people find their true nature and live their lives happily. She offers transformational sessions that are a unique synthesis of Craniosacral therapy, Myofascial therapy and the Oriental healing art of Jinshin therapy. 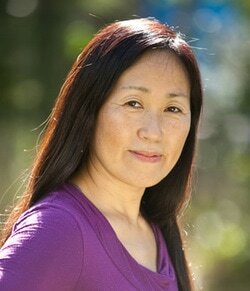 She also teaches self-healing wisdom of the body and heart in Movement Meditation and Yoga therapy. As you tap into your own inner awareness and bodily intelligence, you’ll become aware of the core of your body and feel more alive in your daily life. "Sometimes you get lucky and get a worthy recommendation. Finding Yasue was just that. At age 37, I’ve been dealing with neuralgia and other muscle and body aches for 15+ years, trying everything from medical doctors, medication, chiropractic, massage and acupuncture to alternative medicine. Yasue with her global practice and learned techniques has done wonders for my body. Her incorporation of multiple techniques is what separates her from others. I am now able to manage my active lifestyle and do the things I most enjoy. I’ve been seeing Yasue for over 2 years now. She is truly a diamond."